Today we travel to Izmit, a city of a million people with one Evangelical Church. We will join Pastor Emrei to do outreaches that will culminate on Wednesday evening. 1) Pastor Emre and the church. 2) Many people will read the flyers advertising Wednesday’s evening meeting. 3) The people will see their need for a Savior. 4) That we will reflect the joy of Jesus in our hearts. 5) That we’ll proclaim the gospel clearly. 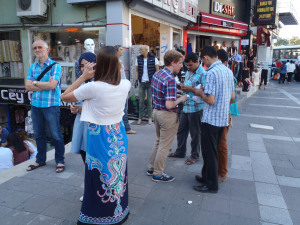 Read the entire Turkey Team post with new pictures.